"Pilot" is the two-part television pilot of the ABC television series Lost, with part 1 premiering on September 22, 2004, and part 2 one week later on September 29. Both parts were directed by J. J. Abrams, who co-wrote the script with Damon Lindelof. Jeffrey Lieber, who had been commissioned by ABC to write the first version of the script, earned a story credit. Filmed in Oahu, Hawaii, it was the most expensive pilot episode up to that time, costing between $10 and $14 million, largely due to the expense of purchasing, shipping, and dressing a decommissioned Lockheed 1011 to represent Flight 815's wreckage. Many changes were made during the casting process, including the selected actors, the characters' behaviors and fates. The pilot introduces the survivors of Oceanic Flight 815, who experience a plane crash and end up on a mysterious island. Three of the characters, Jack Shephard (Matthew Fox), Kate Austen (Evangeline Lilly) and Charlie Pace (Dominic Monaghan), are featured before the crash in flashbacks of their experiences on the plane as it breaks apart in mid-air; this narrative technique would be reused in almost every subsequent episode of the series. The Lost pilot is one of the most critically acclaimed television pilots of all time. Both parts earned high ratings, with Part 1 breaking the record for a pilot episode with 18.6 million viewers, and the episode would later win many awards and accolades. On September 22, 2004, Jack Shephard (Matthew Fox) awakens disoriented in the jungle and notices a yellow Labrador retriever (Madison) darting through the bamboo forest. Following the path it came from, Jack runs haphazardly through the jungle to a beach, where he is confronted by the carnage of the airplane crash of Oceanic Flight 815. Jack, a surgeon, administers medical aid to the survivors, assisting the pregnant Claire Littleton (Emilie de Ravin), enlisting Hurley (Jorge Garcia) to watch her, and administering CPR to Rose Nadler (L. Scott Caldwell), saving her life. After the initial shock passes, Jack retreats to a quiet area beyond the beach to tend to his own injuries, when he notices Kate Austen (Evangeline Lilly) passing through the jungle. He asks her for assistance, which she gives by helping suture a wound on his back. Sayid Jarrah (Naveen Andrews) organizes a clean-up crew, while Hurley salvages meals from the plane's galley and distributes them to the survivors. Shannon Rutherford (Maggie Grace) refuses chocolate offered by her brother Boone Carlyle (Ian Somerhalder), believing that rescue is imminent. A Korean man, Jin-Soo Kwon (Daniel Dae Kim), tells his wife, Sun-Hwa Kwon (Yunjin Kim), in Korean that she should remain close to him at all times. That night, as Jack and Kate decide to search for the plane cockpit as its transceiver would allow the survivors to send a distress signal, loud roaring noises and crashing trees are heard in the nearby jungle. The following morning, the two are accompanied by Charlie Pace (Dominic Monaghan) on their way into the jungle. The cockpit is found leaning against a tree, forcing the trio to climb it to reach the cabin. Charlie disappears into the bathroom while Jack and Kate awaken the concussed pilot (Greg Grunberg) in the cabin. The pilot tells them that the plane had lost radio contact six hours after take off, where it turned back for Fiji and hit wake turbulence. The pilot estimates that the plane was 1,000 miles off course before it crashed, meaning that any rescuers would be looking in the wrong place. He tries using the transceiver, but cannot get a signal. Suddenly the strange roaring noises heard on the beach the previous night return, and when the pilot investigates, he is seized by something outside and blood splatters on the window, prompting the trio to grab the transceiver and flee. During the escape, Charlie falls and Jack returns to help him, while a terrified Kate runs on. After the monster disappears, Kate, Charlie and Jack reunite and find the pilot's bloodied corpse suspended in a treetop. On the airplane, Jack jokingly tells a flight attendant named Cindy (Kimberley Joseph) that his alcoholic drink is not strong, and she gives him a stronger one. Charlie runs by while being called after by flight attendants before turbulence shakes the plane, scaring Rose, who is sitting across from Jack. The two talk, and Rose mentions that her husband is in the bathroom. The plane gets exceptionally shaky, causing a man to hit the plane's ceiling and oxygen masks to fall. Jack, Kate, and Charlie head back to the beach, where ten-year-old Walt Lloyd (Malcolm David Kelley) discovers a pair of handcuffs, which he shows to his father, Michael Dawson (Harold Perrineau). Afterwards, James "Sawyer" Ford (Josh Holloway) gets into a fistfight with Sayid, claiming he is a terrorist who blew up the plane, but their fight is stopped by Jack and Michael. Sayid repairs the transceiver, but it has little battery life and does not have a signal. He explains to Kate that getting to higher ground by heading up the mountains will make it more likely they are able to get a signal. They decide to go inland, alongside Charlie, Shannon, Boone and Sawyer. Along the way, a polar bear charges at them, which Sawyer shoots and kills. When asked about where he found the gun, Sawyer says he took it from a dead U.S. Marshal. Sayid accuses Sawyer of being the marshal's prisoner. Kate takes the gun from Sawyer and Sayid instructs her on how to dismantle it. Back at the beach, the marshal (Fredric Lane) wakes up as Jack is suturing him, and asks Jack, "Where is she?" Inland, Sayid turns on the transceiver and it has a signal. However, it is being blocked by a looping transmission in French, which Shannon translates as "I'm alone now, on the island alone. Please someone come. The others... they're dead. It killed them. It killed them all." Given how the transmission is repeating itself every 30 seconds and how each repeat states the number of repeats thus far, Sayid calculates that it has been repeating for over sixteen years. Charlie asks the others, "Guys, where are we?" Anxious and under suspicion from the flight attendants, Charlie runs to the bathroom, where he locks himself to snort heroin. After the plane becomes shaky, Charlie is slammed against the bathroom ceiling, and decides to leave. After being nearly hit by a refreshment cart, Charlie rushes to a seat several rows back and straps himself in as the plane shakes. Kate is revealed to be the marshal's prisoner, wearing the handcuffs that Walt found in the jungle. As the turbulence hits, the marshal is knocked unconscious and badly bloodied by a falling suitcase. Kate struggles to put on her oxygen mask due to the handcuffs, so she uncuffs herself using the marshal's keys and puts the marshal's oxygen mask on him before attaching her own, at which point the tail end of the plane suddenly breaks off and flies away. J. J. Abrams directed the episode. The series began development in the summer of 2003, when ABC senior vice president Thom Sherman decided to order from Spelling Television a script based on an idea of network president Lloyd Braun, who envisioned a series that was a cross between the novel Lord of the Flies, the movie Cast Away, the television series Gilligan's Island, and the popular reality show Survivor. Braun had titled his concept Lost after a failed reality show that had broadcast in 2001. Writer Jeffrey Lieber was contacted by Spelling's vice president of series development Ted Gold, and in September 2003 pitched to ABC the concepts for what he called Nowhere. Sherman approved the idea and hired Lieber to write a script, but Braun wound up rejecting Lieber's draft and subsequent rewrites. In January 2004 Braun contacted J. J. Abrams, who developed the TV series Alias for ABC, to write a new pilot script, which would retain the title Lost. Although initially hesitant, Abrams warmed up to the idea on the condition that the series would have a supernatural angle to it and he was assigned a writing partner. ABC executive Heather Kadin sent him Damon Lindelof, who had long intended to meet Abrams as he wished to write for Alias. Together, Abrams and Lindelof developed the characters and plot of Lost, along with creating a series "bible" which would store the major mythological ideas and plot points for an ideal five to six season run for the show. Lindelof and Abrams worked between January 13 and 16, when Lindelof sent a 21–page outline to ABC's executives. A complete first draft of the pilot script was delivered on February 24, and the teleplay kept on being revised, with the final script arriving on April 19. The development of the show was constrained by tight deadlines, as it had been commissioned late in the 2004 season's development cycle and Braun estimated that the whole process from writing to post-production took 6 to 8 weeks. Despite the short schedule, the creative team remained flexible enough to modify or create characters to fit actors they wished to cast. Though Abrams and Lindelof did not use Lieber's work as inspiration for their own, Lieber's request for arbitration at the Writer's Guild of America pointing out the similarities in both scripts earned him a story credit. Lieber would later say the series would drift much from his concepts in Nowhere, declaring Lost was "more like Lord of the Rings than Lord of the Flies". Writer-producer Anthony Spinner later sued ABC on the accounts that he submitted a script titled "L.O.S.T." to the network in 1977, but the case was dismissed on the accounts that none of the people involved with Lost had read Spinner's work. 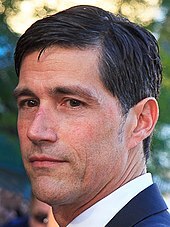 Matthew Fox portrayed Jack Shephard, a doctor who is the main protagonist of the series. In the initial plans for the series, Jack was going to die midway through the first episode. The role of Jack was originally offered to Michael Keaton, but when the producers quickly changed their minds about Jack's death, making him the leader, Keaton gave up the job. After Matthew Fox's casting as Jack, the character was established as a leader, and the airplane pilot was introduced to take Jack's place as The Monster's first victim. The pilot wound up being played by Greg Grunberg, a childhood friend of Abrams who the producer brings into most of his projects. Around seventy-five women of different shapes, sizes, ethnicities and ages auditioned to be Kate. In the initial plans, Kate would emerge as the leader after Jack died. She was not going to be a fugitive, instead her husband was going to go to the bathroom shortly before the plane split in mid air, and she would remain adamant on the Island that he was alive. This ended up being used for Rose's (L. Scott Caldwell) character instead. The producers were impressed with Canadian Evangeline Lilly's audition for Kate, as she displayed the confidence with vulnerability that they were looking for. As this was Lilly's first role, she had difficulty obtaining a visa to work in America. She was supposed to start on the first day of filming, but the schedule was rearranged to give her more time, and in the meantime, the producers began auditioning again in case the visa did not come through. However, during one of the auditions, they got an email confirming that she had obtained her visa and could start work on the show. Matthew Fox, Dominic Monaghan and Jorge Garcia originally auditioned for the role of Sawyer, who at the time was supposed to be a suit-wearing city con man, but the role was given to Josh Holloway. Garcia was the first actor the producers knew they were going to cast. While the producers thought Garcia was spectacular, they did not think he fit in the role of Sawyer, so they created the Hurley character for him instead. When Holloway auditioned for Sawyer, the producers liked his southern accent and the edge he brought to the character (Holloway reportedly forgot his lines and kicked a chair in frustration). The producers knew he did not suit the role, but thought he was very watchable, so they rewrote the role to suit him, making him more feral, Southern, but kept the same intelligence he originally had. After appearing in The Lord of the Rings, Dominic Monaghan was offered many fantasy-based roles, like elves and pixies. He was keen to portray a different role, so he wanted a contemporary part that had layers and an edge. Originally Charlie was an older rocker that has been a big hit in the 1980s but now had a heroin addiction. After the producers enjoyed Monaghan's audition of Sawyer, they decided to cast him as Charlie and rewrote the script to make Charlie a young has-been instead. 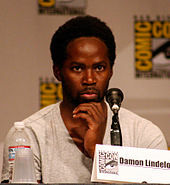 Harold Perrineau plays Michael Dawson, a father. When the producers were auditioning actors for roles in Lost, Harold Perrineau was in the area. The producers called it a "natural move" to have him audition. Although initially skeptical about the show, he took the role when Lost creator J. J. Abrams explained more about it. A lot of children were seen for the role of Walt. They were narrowed down to the top three, with Malcolm David Kelley winning it, after the producers were impressed with his role in Antwone Fisher. Abrams had worked with Terry O'Quinn previously on Alias, and was keen to work with him again. He explained to O'Quinn that although the role in the first episodes would be fairly small, the character will develop afterwards. O'Quinn took the role as he trusted Abrams. He was also the only character who did not have to officially audition for a part of a main character. The producers were looking for someone who had a "Paris Hilton quality" to play Shannon, but she could not just be shallow, as the storyline would require more than that. A lot of women were auditioned before the producers finally settled on Maggie Grace. She was written to be an antipathetic character in the first season as the producers needed a character they could use to create opposition and conflict. Unlike many other characters of the first season, who were rewritten based on their actors, Boone was largely the same through production. He was originally going to be named Boone Anthony Markham V, going by the nickname, "Five". Ian Somerhalder was cast in the role, but he did not want to shoot a pilot; however, he jumped at the opportunity once he found out he would be working with Abrams. Lost was planned to be a multi-cultural show with an international cast. The producers thought it was essential that an Australian was cast for the part of Claire, and the Oceanic 815 was leaving from Sydney. Emilie de Ravin was working in Edmonton, so was unable to go to the auditions, which were being held in Los Angeles. From a video she sent to the producers, they were able to tell that de Ravin had the youth and sweetness required for the role, but also looked as though she had some life experience. Sayid was not in the original draft of the pilot episode, but executive consultant Jeff Pinkner had worked with Naveen Andrews on a short-lived ABC series called The Beast, and was keen to have him on Lost. The producers were surprised that Andrews was interested in the role. When they cast him, all Andrews was told was that Sayid was from Iraq and had been in the army. Yunjin Kim originally auditioned for Kate. At her audition she told the producers that she spoke fluent Korean, having been raised in South Korea, where she had starred in several films. The producers were impressed with Kim's performance and wrote her the character of Sun, who was planned to be someone who could not speak English, but after examining her relationship with her husband, the audience would learn that she does in fact speak it. Daniel Dae Kim was cast in the role of Jin, Sun's husband. Dae Kim described his audition as a "really interesting experience". He found it especially hard as it was his first time acting in Korean, and he had not spoken in it regularly since being in high school, when he would talk to his parents. Filming began on March 11, 2004, with soundstage shooting in Los Angeles for the scenes set inside the flight. The primary location was the Hawaiian island of Oahu. The wreckage of Flight 815 was made with a Lockheed L-1011 built in 1972 and previously used by Delta Air Lines until 1998, that after being purchased by ABC was broken up and sent to Hawaii by ship. The purchasing, shipping, and dressing of the aircraft body accounted for most of the pilot's budget, which at an estimated $10 to $14 million was the most expensive pilot episode up to that time. Greenlighting such an expensive and risky project amidst ABC's low ratings eventually led Braun to be fired by The Walt Disney Company, ABC's parent company. J. J. Abrams decided not to do aerial shots to avoid revealing too much of the island, and also because he felt that the different point of view could confuse audiences. Filming wrapped on April 24, Lindelof's birthday. Extensive usage of visual effects, particularly bluescreen, was used in the pilot. One effect in particular was re-shot just before part 2 was broadcast. The scene involving a stuffed polar bear was used for a pre-broadcast commercial and was freeze framed and mocked on the internet, prompting ABC to replace it with a CGI bear. The pilot episode's world premiere was on July 24, 2004 at Comic-Con International in San Diego. Part 1 had its first ABC broadcast on September 22, 2004, reaching a ratings record for a pilot episode, with 18.6 million viewers, and on the following week, part 2 scored 10.5/17 on the Nielsen ratings, watched by 17 million viewers. Both parts aired on the same night for its first UK broadcast on Channel 4, August 10, 2005, and it became an instant hit. It was the second most watched programme for Channel 4 for that week, with ratings of 6.75 million, second only to Big Brother. Reviews were favorable upon release. IGN gave it a 10/10 score declaring that Lost "delivers on every promise it makes to its audience." In IGN's 2008 series of "Flashback Reviews", IGN's Chris Carabott changed the scores; he gave part 1 a 9.5/10, saying that the show's mysteries "would keep many of us captivated for the next four years"; he gave part 2 a 9/10, saying that "It really is a roller coaster of emotion and that sense of dread that sets in here is brilliantly portrayed." Entertainment Weekly gave an 'A', stating that even non-science fiction and fantasy fans can like it, and USA Today gave it 4 stars praising the cast. The Futon Critic later chose the pilot as the fifth best TV episode of 2004. TV Guide ranked the episode fifth on a list of the top 100 television episodes of all time. For its 65th anniversary, TV Guide picked it as the second best episode of the 21st century. At the 2005 Emmy Awards, Lost won a Primetime Emmy Award for Outstanding Drama Series. 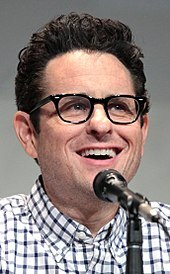 J. J. Abrams won an Emmy for Outstanding Directing for a Drama Series for the pilot, with Mary Jo Markey winning Outstanding Single-Camera Picture Editing for a Drama Series and Michael Giacchino winning Outstanding Music Composition for a Series (Dramatic Underscore). The show in general won Outstanding Special Visual Effects for a Series and Outstanding Casting for a Drama Series, while receiving additional nominations for Outstanding Sound Editing for a Series and Outstanding Writing for Drama Series. Casting director April Webster won an Artios Award for her work in the pilot. The first part of the pilot also won two Golden Reel Awards for Best Sound Editing in Television Short Form: Sound Effects & Foley and Dialogue & ADR, and a VES Award for visual effects. The episode was nominated for a Hugo Award and awards from the American Society of Cinematographers, Art Directors Guild and Directors Guild of America. "Pilot", along with "House of the Rising Sun" and "The Moth", won a Prism Award for Charlie's drug storyline. ^ ""Lost" Pilot: Part 1". Internet Movie Database. Retrieved March 1, 2014. ^ ""Lost" Pilot: Part 2". Internet Movie Database. Retrieved March 1, 2014. ^ Dotinga, William (April 8, 2013). "'Lost' Royalties Demand Had Smoke but no Fire". Courthouse News Service. Retrieved February 27, 2014. ^ a b c "SPINNER v. AMERICAN BROADCASTING COMPANIES INC Court of Appeal, Second District, Division 8, California. Anthony SPINNER, Plaintiff and Appellant, v. AMERICAN BROADCASTING COMPANIES, INC., Defendant and Respondent". California Court of Appeal. March 8, 2013. Retrieved March 20, 2013. ^ a b Bernstein, David (August 2007). "Cast Away". Chicago magazine. ^ a b Sepinwall, Alan (2013). "6: Do You Want to Know a Secret? ... The Perfect Storm of Lost". The Revolution Was Televised: The Cops, Crooks, Slingers, and Slayers Who Changed TV Drama Forever. Simon and Schuster. ISBN 1476739684. ^ a b Craig, Olga (August 14, 2005). "The man who discovered Lost — and found himself out of a job". London: The Daily Telegraph. ^ a b Cagle, Jess, ed. (May 14, 2010). "Lost: How It Began". Entertainment Weekly (1102). ISSN 1049-0434. OCLC 137343926. Retrieved December 12, 2011. ^ Molloy, Tim (September 23, 2011). "Damon Lindelof's History of 'Lost' (A Show He Longed to Quit)". The Wrap. Retrieved March 4, 2014. ^ Jensen, Jeff (November 24, 2006). "When Stephen King met the Lost boys..." Entertainment Weekly. Retrieved November 24, 2007. ^ Burk, Bryan, Lost Season 1 DVD (extras), Buena Vista Home Entertainment, September 6, 2005. ^ a b c d e f g h i j k l m n o Before They Were Lost (Documentary). Lost: The Complete First Season, Disk 7: Buena Vista Home Entertainment. 2005. ^ Abrams, J.J., Lindelof, Damon and Burk, Bryan. Audio commentary for Pilot, Parts 1 and 2. Lost: The Complete First Season DVD: Buena Vista Home Entertainment. ^ Lindelof, Damon & Cuse, Carlton, (November 14, 2005) "Official Lost Audio Podcast November 14, 2005," ABC. ^ a b Welcome to Oahu (Documentary). Lost, the Complete First Season: Buena Vista Home Entertainment. ^ Designing a Disaster (Documentary). Lost, the Complete First Season: Buena Vista Home Entertainment. ^ Ryan, Tim (May 17, 2004). "New series gives Hawaii 3 TV shows in production". Honolulu Star-Bulletin. ^ Phegley, Kiel (March 27, 2007). "TV Q&A: 'Lost'—Jack Bender". Wizard. Archived from the original on October 2, 2007. Retrieved October 3, 2007. ^ Ryan, Tim (March 18, 2003). "New TV show 'Lost' is found filming on Oahu". Honolulu Star-Bulletin. Retrieved March 2, 2014. ^ Lost: On Location – Exodus, Part 1 (Documentary). Lost, the Complete First Season: Buena Vista Home Entertainment. 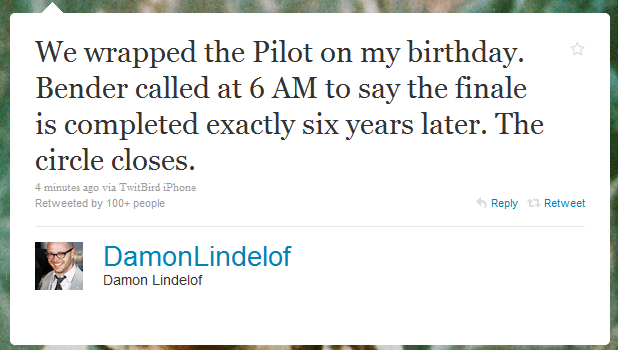 ^ Lindelof, Damon (April 24, 2010). "We wrapped the Pilot on my birthday. Bender called at 6 AM to say the finale is completed exactly six years later. The circle closes". Twitter. Archived from the original on April 24, 2010. Retrieved May 12, 2010. ^ "Comic-Con 2004: Saturday's Programming". Comic-Con. Archived from the original on February 9, 2007. Retrieved January 25, 2012. ^ Kissell, Rick (September 25, 2004). "ABC, Eye have quite some night". Variety. ^ "Struggling ABC May Have Found a Hit in 'Lost'". Reuters. Lostmedia.com. October 1, 2004. Archived from the original on January 7, 2008. Retrieved September 22, 2007. ^ "Top 30 Programmes". BARB. Retrieved February 27, 2014. ^ "IGN: Pilot, Part 1 Review". IGN. September 22, 2004. Archived from the original on February 6, 2012. Retrieved September 22, 2007. ^ Carabott, Chris (June 13, 2008). "Lost Flashback: "Pilot (Part 1)" Review". IGN.com. Retrieved May 30, 2010. ^ Carabott, Chris (June 20, 2008). "Lost Flashback: "Pilot (Part 2)" Review". IGN.com. Retrieved May 30, 2010. ^ "Lost - Do Not Use (2004 review)". Entertainment Weekly. September 24, 2004. Retrieved September 22, 2007. ^ Bianco, Robert (September 21, 2004). "'Lost' finds fresh adventure in familiar story". USA Today. Retrieved September 22, 2007. ^ Sullivan, Brian Ford. "The 50 Best Episodes of 2004: #10–1". The Futon Critic. Retrieved September 22, 2007. ^ Roush, Matt (April 2–15, 2018). "65 Best Episodes of the 21st Century". TV Guide. ^ "2005 emmy award nominations for drama series". Emmy Awards. Archived from the original on February 16, 2006. Retrieved December 21, 2011. ^ "The 57th Primetime Emmy Awards and Creative Arts Emmys Nominations" (PDF). Academy of Television Arts & Sciences. Archived from the original (PDF) on February 16, 2008. Retrieved March 2, 2008. ^ Covel, Bonnie. "'Lost's Emmy History". About.com. Archived from the original on April 14, 2014. Retrieved February 27, 2014. ^ "Artios Award Winners". Casting Society of America. Retrieved December 1, 2008. ^ "Lost's Awards". Internet Movie Database. Retrieved February 28, 2014. ^ "3rd Annual VES Awards". Visual Effects Society Awards. Archived from the original on February 8, 2012. Retrieved December 21, 2011. ^ "2005 Hugo Awards". Hugo Awards. Retrieved March 6, 2008. ^ "The ASC Awards for Outstanding Achievement in Cinematography – Complete Listing of Nominees and Winners from Past Awards (2004)". American Society of Cinematographers. Archived from the original on July 7, 2011. Retrieved March 5, 2008. ^ "57th Annual DGA Awards". Directors Guild of America. Archived from the original on March 6, 2006. Retrieved February 27, 2014. ^ Hombach, Jean-Pierre (2010). Ian Somerhalder. Lulu.com. p. 64. ISBN 9781471606892. This page was last edited on 28 January 2019, at 06:35 (UTC).